BBM beta app for Windowsphone: Blackberry started enrolling beta testers for the beta version of the long awaited BBM messenger for Windows Phone. Few days back Blackberry published the private beta of BBM for Windows Phone at the store. Now the company has started enrolling beta testers for the app. Any one can apply for the registration. 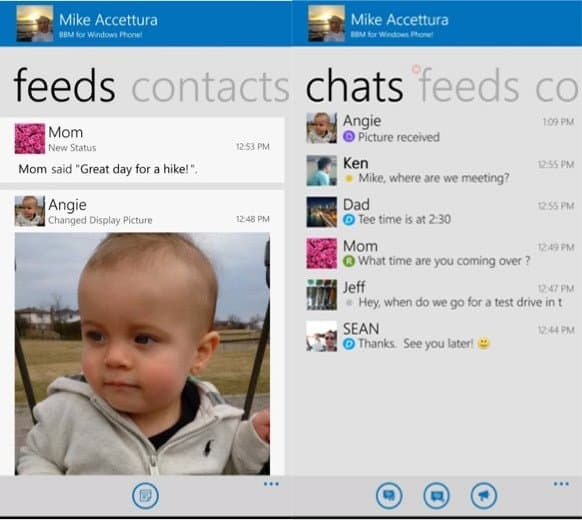 The BBM app for Windows Phone will mainly have 3 sections: chat,feeds and contacts as you can see in the above screenshot. In contacts you can see all your BBM contacts. In chat you will see all your chats including group chats,one to one BBM chats. And in feeds you will see the status updates from your BBM contacts, what they are upto and all the social updates. Unfortunately, the registration is already full but don’t feel heartbroken, register now and you will be placed at “waitlist“. Join before enrollment ends.